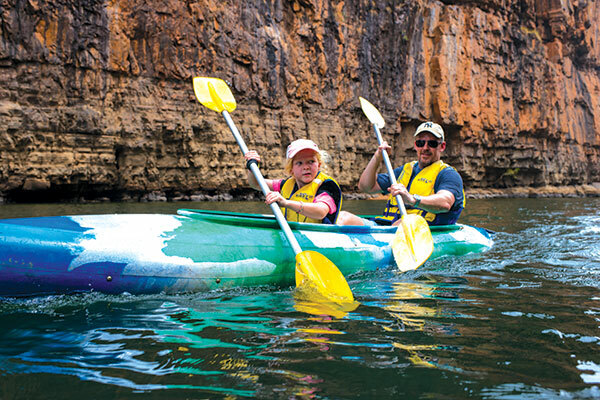 Amazing rock formations rose sharply from the water's edge as I paddled with my six-year-old daughter Harriet along the Northern Territory’s beautiful Nitmiluk Gorge. We started our journey exploring the sights and scenery around Katherine, a 317km drive from Darwin. 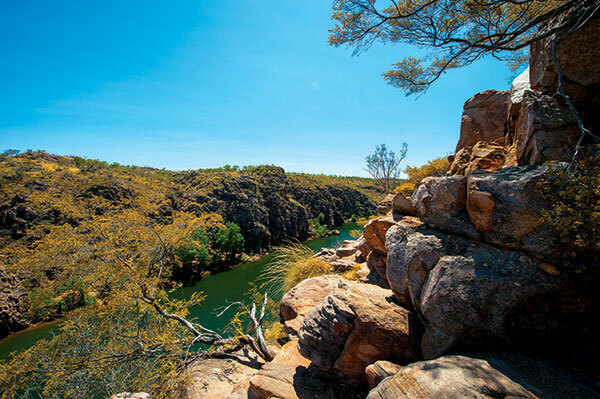 The awe-inspiring Nitmiluk Gorge was a 30-minute trip from Katherine. The scale of the rugged beauty of the gorge is awe-inspiring. To say the NT is a pretty destination is a complete understatement. The vastness was quite different to anything I had witnessed before – the landscapes and colours painting an amazing backdrop to the Kakadu Highway. It was a terrific opportunity for our girls to see a completely different part of Australia, including wild animals, and learn a lot about Australia’s Indigenous history. 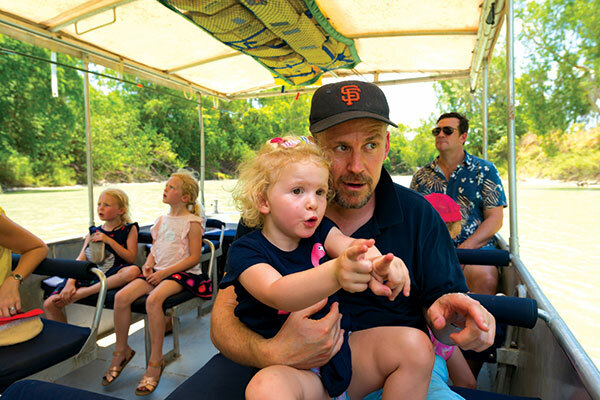 Enroute to Katherine from Darwin we experienced one of the highlights of our trip – the Guluyambi Cultural Cruise on the East Alligator River in the Kakadu National Park, touted as one of Australia’s last true wilderness areas. 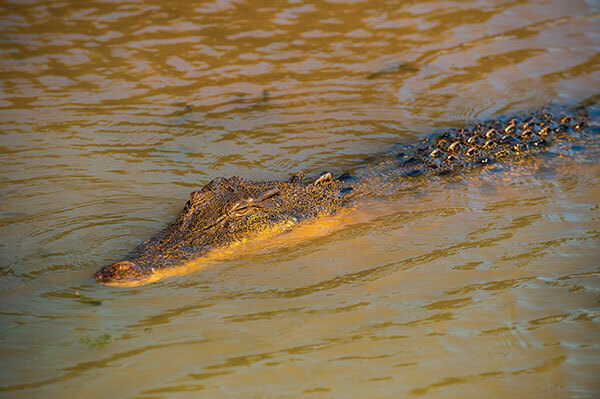 As we made our way along the croc-infested waterways, our youngest daughter Georgie and I played ‘spot the croc’ – but there were almost too many to count, as they nestled up against the man-made road which was the only land-based access across to Arnhem Land. Here you can see ancient Indigenous rock artworks painted in kangaroo blood on the walls. 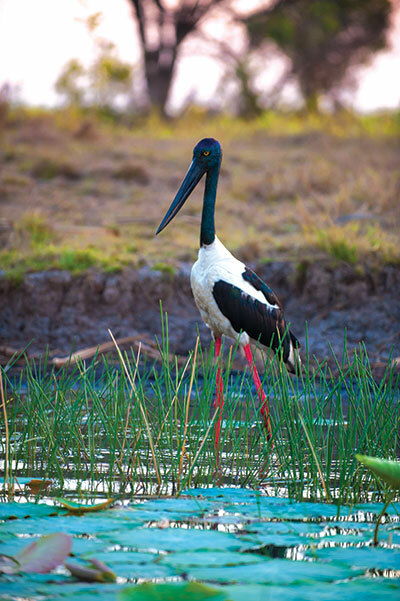 Kakadu’s vast and varying landscapes also includes some pretty incredible wetlands. 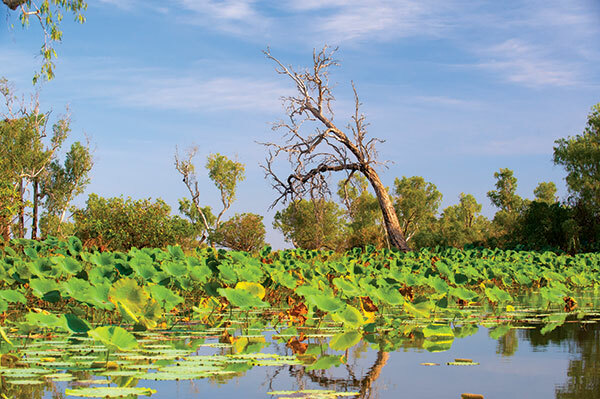 We jumped onto another nearby cruise along the Yellow Water Billabong and, while we saw some more crocs, the scale of this wetland area was amazing. From rare birds to water buffalo to lily ponds, the cruise offered an array of sensory experiences to keep everyone entertained and engaged. 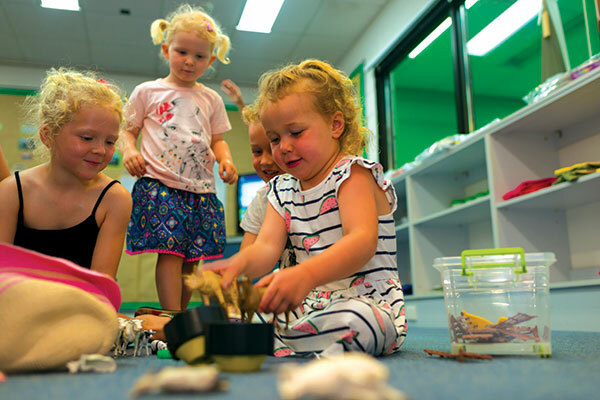 The history of the school, which services the remote communities all across the NT and northern WA, provided amazing stories and our children were enthralled at seeing kids interact via video conference with their teachers who are literally thousands of kilometres away. It’s thanks to this school so many children living in remote areas can get a quality education. Another Katherine highlight was the Top Didj Cultural Experience. 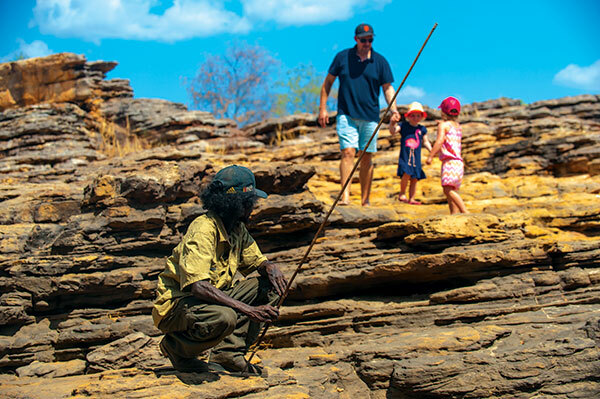 The story of our teacher and the way he grew up on the land before making his way into "western society" later in life showed us how different life still is in the remote parts of Australia. His artistry was impressive and he taught us the skill of raark. This is not the traditional dot painting style so synonymous with indigenous art, rather a line-style crafted using the natural colours of the region. In my office proudly sits the output of our efforts – five raark paintings from three generations of the family which is a permanent reminder of our time in the NT. It’s fair to say we did not want to leave Katherine and, as we headed north to Darwin to fly home, we said it was unlikely we would see anything similar the rest of the trip. How wrong we were. 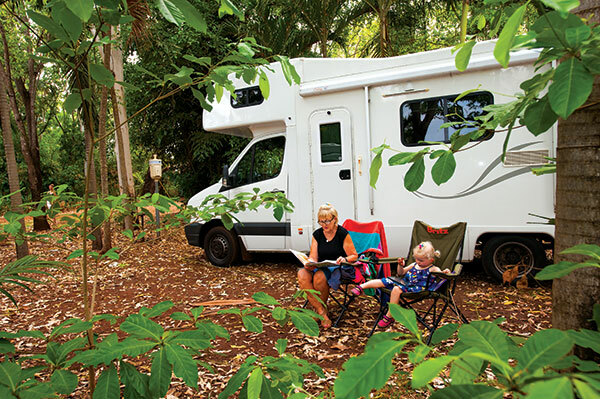 Litchfield National Park was as green as Kakadu was red and as lush as Katherine was vast. 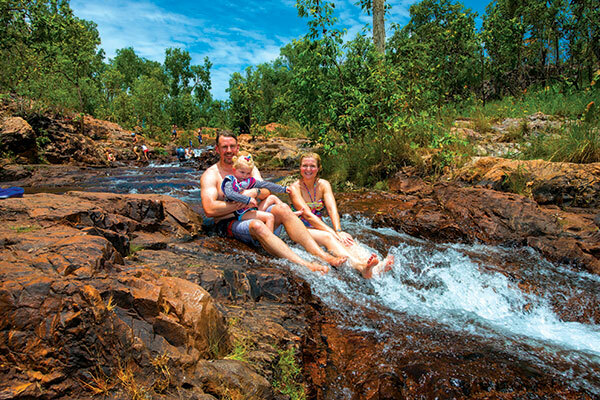 Litchfield National Park offered us all a last chance to immerse ourselves (literally) in the great scenic beauty of the NT. Wangi Falls was a waterhole surrounded by rock formations and a trickling waterfall (we were there at the end of the dry season) and it was a great place for the family to relax and beat the heat of the day. Buley Rockholes was a huge hit with the kids. Water rushed down the rockholes and they had a ball splashing in and sliding down into the lower waterholes. Our family always considered NT to be one those ‘not right now’ destinations. We thought we would see others first, but add it to our seemingly ever-growing bucket lists for when the kids were older.